The other day I got an email from Team High School telling me about all the wonderful work they were doing. Evidently 200 members attended workshops, which is surely good, as everyone needs to work on one thing or another. Also, there will be Team High School Awards, for those who've done outstanding work on whatever it is the Team does, or perhaps for something else. I can't be sure, as I have no notion what Team High School deems award-worthy. 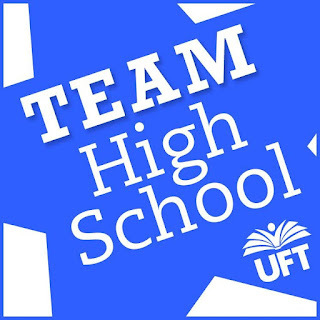 Here's the thing--UFT High Schools elected exactly seven people in the last election. I know because I'm one of them. Thus far, Team High School hasn't bothered to ask any of us anything whatsoever about anything. Team High School means jobs for someone or other. I'm not sure who, though I have a strong inkling it starts with the Unity Caucus members who got paid to run the workshops 200 people attended. I was actually in a working group with one of them, I think, and I noticed him asking Michael Mulgrew a question in an informational video about Friedrichs. This was one of those spontaneous videos where people just sit around and ask the President off-the-cuff questions, and every one of them just happens to be a UFT patronage employee for whom actual high school teachers did not vote. It's curious Mulgrew appears to favor such spontaneous chat. It makes me wonder why, when real live elected High School Executive Board members ask questions, he doesn't even hang around to listen, let alone respond. What does Team High School do besides send out newsletters and provide work for Unity loyalists? Well, it's hard to say, and I can only assume we lowly high school teachers aren't supposed to ask. If they wanted our input, or that of anyone who hasn't already signed a loyalty oath, they'd ask for it. Of course, that hasn't happened, and Team High School rolls along on its merry way, with no input whatsoever from the people it purports to represent. The good thing is, whether or not you voted for Team High School (and most of you did not), you have the privilege of paying for it. Isn't that a cool logo? Your dues at work. But when you speak, when you say we want a new voice in the UFT, they say forget about it. You get no voice in the AFT, you get no voice in the NEA, you get no voice in NYSUT, and you don't even get a voice in the organization that presumes to speak for you, Team High School. And that's the way the UFT rolls. Gee, I can't begin to imagine why more than half of working teachers will decline to pay dues when they get a Friedrichs do-over. After all, leadership surely knows better than those of us who actually vote. Otherwise, they'd seek input from us. And you have to admit, Team High School with No Elected Representation Whatsoever hasn't got much of a ring to it. Still, it's not the kind of thing that makes me "Loud and Proud." How about you?